In our ongoing search for the best blade for your circular saw, we come to the popular Irwin Marathon circular saw blade. A lot of our Pros swear by Diablo while Makita has been making excellent blades for a long time and Milwaukee recently got in the game with a premium line. We ran the Irwin Marathon through our standard in-house tests and also sent some out to one of our Pro remodeling crews to get some additional feedback. 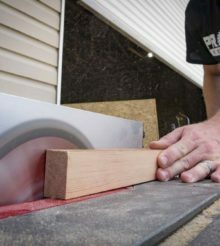 This can be a less expensive blade for any circular saw and you won’t be disappointed. If you want the fastest cutting blade, you’ll need to look to Makita and Diablo. However, the stability of the Irwin Marathon makes it a go-to for worm drive circular saws. One of the first I noticed is the thicker plate Irwin uses. They’re also a little heavier on the kerf at 0.071 inches – significantly thicker than Diablo’s 0.059-inch and Makita’s 0.057-inch kerfs. I expect that to translate to a slower cut and that’s exactly what we got. The big takeaway from our test is that even though it’s slower in the cutting department, it tracks very well. The thicker plate resists wandering better than any of the thinner blades. Luis from QMBS is our go-to remodeler and he goes through a lot of circular saw blades. After putting the Irwin Marathon through its paces, he put in the hands of his crew to try as well. Even though Irwin doesn’t get this blade in the class of ultra-thin kerf, it is still a thin kerf blade and cuts well. It cuts very smooth with no noticeable vibration or wobble. In dry, untreated wood, there’s not much difference between this and his other blades. However, it really starts to set itself apart from cheap blades in PT, even more so when it’s wet. An interesting find is that the blade doesn’t leave quite as much tearout as most of the framing blades they use. Overall, the configuration here is as good as anything else you might want to use. Irwin Marathon blades come in several sizes and tooth configurations. The 24T version (#24030) runs $7.98 currently, which is a couple of dollars less than the other premium blades. Given its performance, that’s a pretty good price. Even though the Irwin Marathon circular saw blade doesn’t cut as fast as some of the other new premium options, it’s not obnoxiously slow. Its excellent tracking and vibration control make up for the slight lag. Looking at the blade as a whole, you won’t be disappointed in the performance on a sidewinder and I like it as a primary blade for your worm drive. Check out all Irwin products at Acme Tools! Want More Blades? Check These Out!